This art session, I promised a couple handmade gifts for the children to give for the holidays, in addition to my usual art lessons. 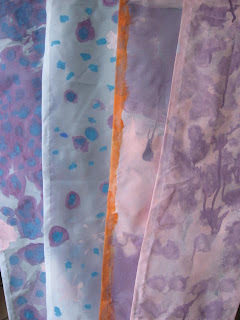 Thank goodness for a fabulous post by "That Artist Woman" for hand painted scarves. For this project we used a sheer lining fabric. Our scarves measured about 8" X 58", which is long enough to tie in a number of ways. They can be hemmed prior or after painting. Fortunately for me, my mother kindly hemmed each one by hand (although this can be done by machine). 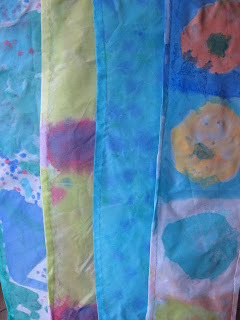 I provided a variety of colors of acrylic craft paint diluted with water to an inky consistency. This gives a wonderful watercolor-like effect. After they are dry, they should be delicately washed with a little detergent and fabric softener (which will fade the paint slightly). I am thrilled with the wide range of results of this project. 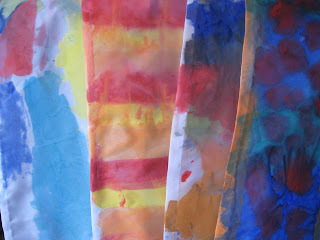 Some opted to paint stripes or polka dots and some went for a more spontaneous abstract effect. I even had a 5 year old boy who without hesitation, proceeded to paint what looks very much like Kandinsky's "Squares with Concentric Circles." Their Moms will truly cherish these one of a kind wearable works of art! What a great idea to help them do some handmade gift--I'll have to remember that for next year. Hey Mary, these turned out great..can't believe your mom hemmed them by hand (terrific). Love all the designs!